Roaring Stock Market Rally Coming! Stocks have been under selling pressure for the lst 8 weeks and yet the indices continue to be above the key support levels. By most measures the U.S. economy is in excellent health. 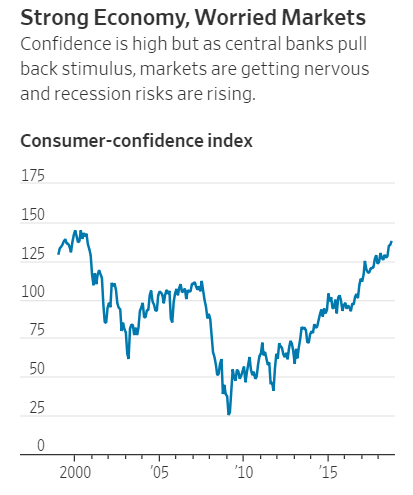 Yet stocks are sinking, yields on corporate bonds are rising and commodity prices are tumbling—all typical precursors of a slowdown or recession. There are a few reasons which we can immediately forsee. First, while the U.S. is cruising a wave of fiscal stimulus, growth in the rest of the world is slowing. That’s creating problems for companies that do export business. Second, FED is set on a rigid path of raising rates, tightening conditions and reducing balance sheet. Given the simulataneous actions of ECB and BoJ, we believe has fared way beyond what could have been a much sharper decline. However we are just about 15% from the highs seen this year. US Housing starts climbed 1.5% in October from the prior month to a seasonally adjusted annual rate of 1.228 million, the Commerce Department said Tuesday. The growth was due to a rebound in construction of buildings with two or more units. Starts fell in October for single-family construction. 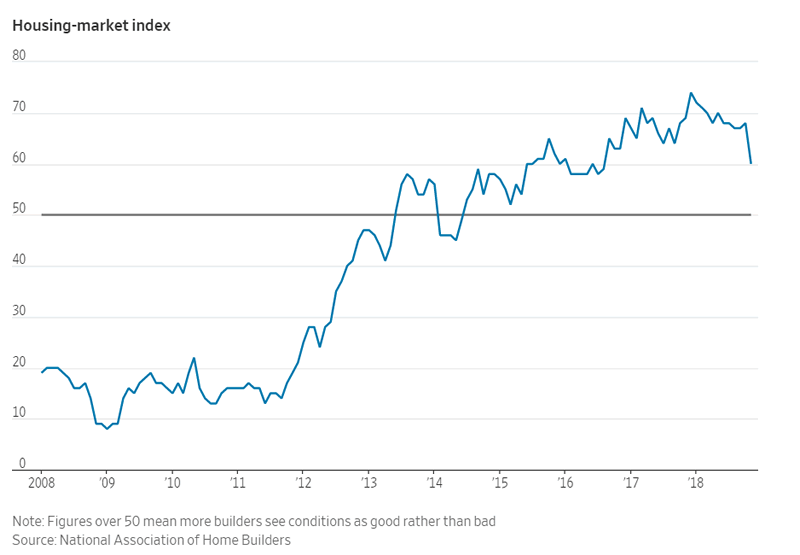 Residential building permits, which can signal how much construction is planned, dropped 0.6% from September to an annual pace of 1.263 million last month. Permits were down for single-family homes as well as buildings with multiple units. If there is one index which has held up well, it is the consumer confidence. 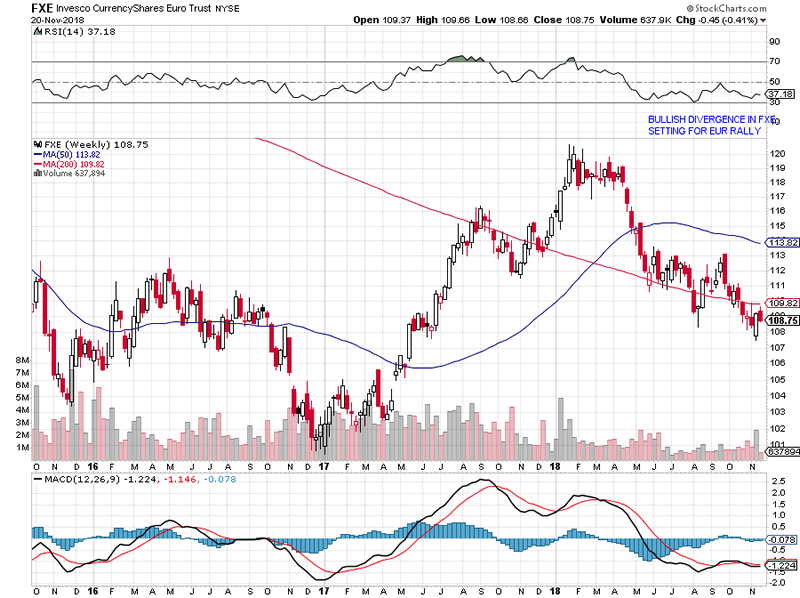 However it is to be seen the hit on the confidence when the current stock market turmoil is priced in future readings. We believe the US consumer willingness to keep spending, will support stock into the next 2 quarters. NYSE number of stocks abvoe 200 DMA is at previous lows. 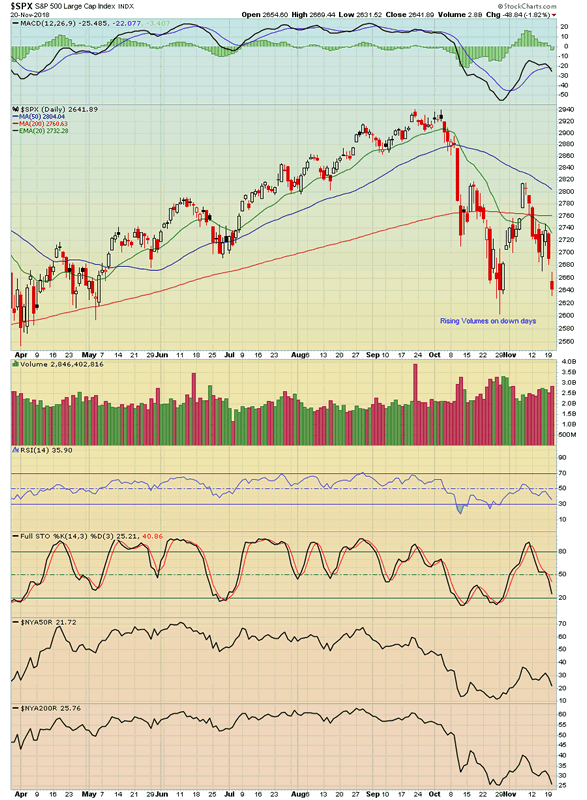 The long term trend for stocks has turned bearish but it is to be seen if this alone can trigger a wave of selling or the buy the dip syndrome will support stocks. Investor appetite for high yield assets has fallen. 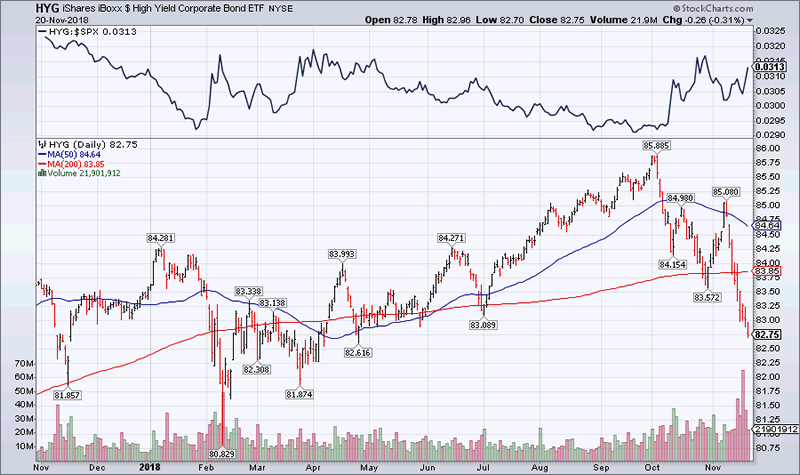 HYG etf is below 200 DMA and at a 7 month lows but is at a key support at 82.5. We could see buying come in here supporting broader risk assets. 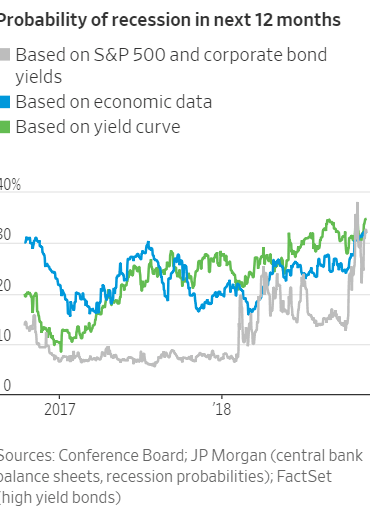 Assessing forward-looking market and economic data, economists at JPMorgan Chase & Co. put the odds of a recession beginning in the next 12 months at around one in three. A year ago, their models put the probability at 8% to 27%. However even at 33%, it is still not something that should worry the yield seeking investors. 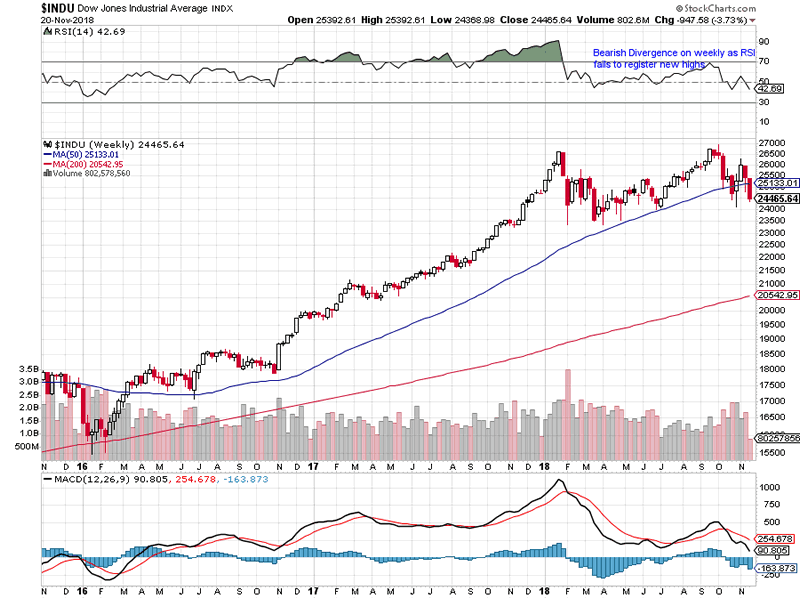 The dow jones industrial average weekly formation shows a clear bearish divergence. The RSI for the last 14 weeks has failed to hold even above 50 mark while the stocks have tried to rebound. The dow jones transportation index is below both its short terma and long term average. 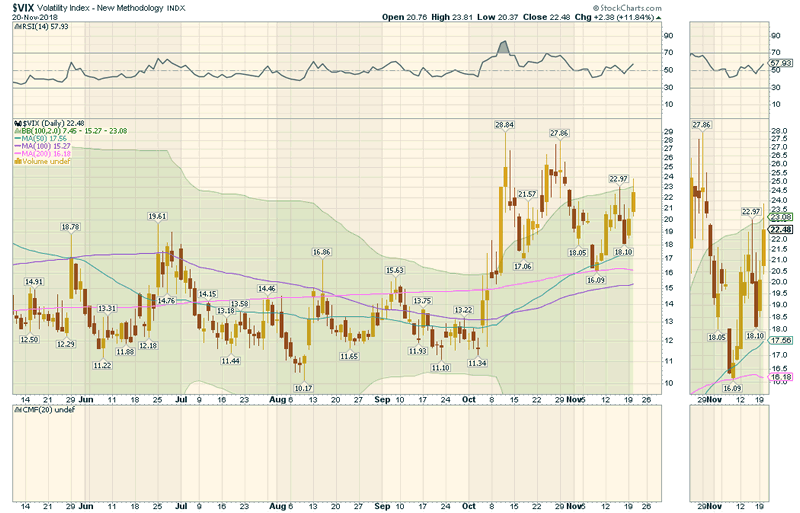 Vix is just over the 2 standard deviation of the 100 DMA. 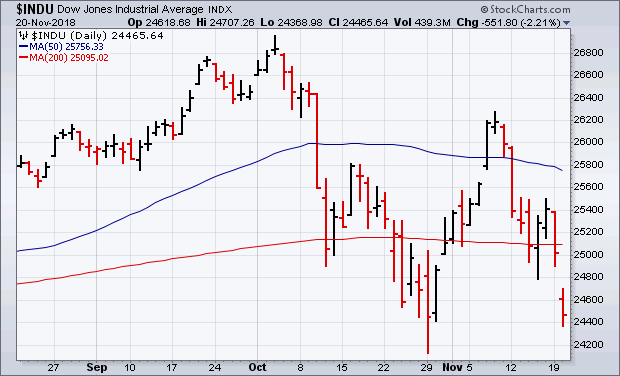 However the lack of sustained move higher suggests that there is relative calm in the markets. 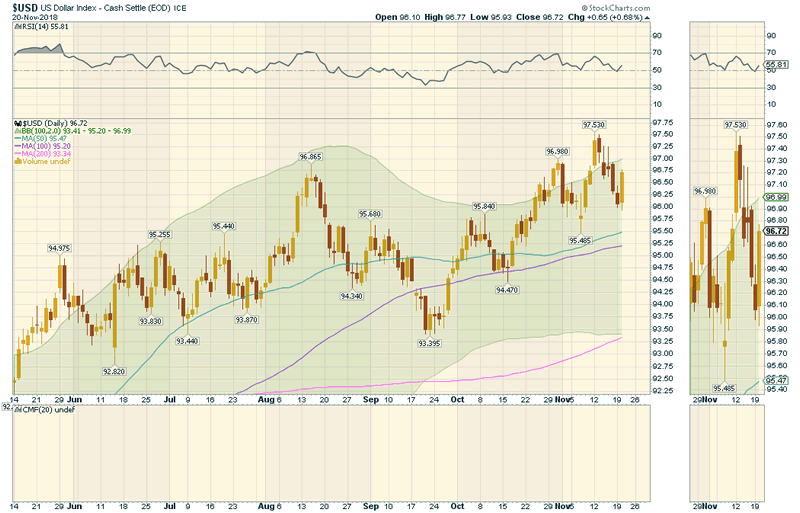 The US Dollar index has been strongly pushing higher since November 1st. But attempts above 97 has been met with selling. The US 10 year yield is the highest among the g8 countries and yet we have not seen the kind of rally expected. It has been choppy uptrend. USD bulls are wary of any slowdown in US economy. They are also aware that the FED may be at the end of rate hiking procedure. The EUR ETF is showing marginal bullish divergence. Last week dip to 1.1220 was bought as the pair raced higher to 1.1450 since then. We see strong buying in EUR despite the high US 10 year yield. 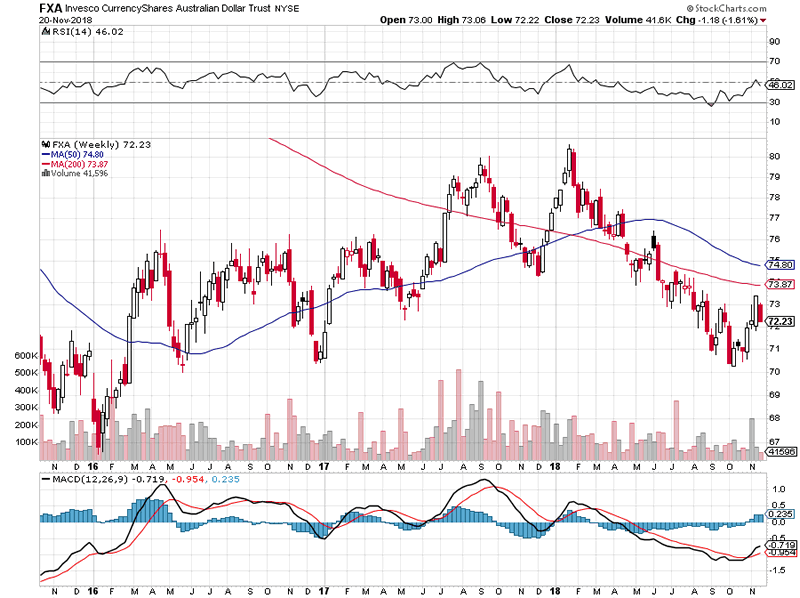 The Australia dollar has broken above its downtrend in 2018. We could see a strong rally in Australian dollar into 2019. We see 0.7600 against US dollar before Jan2019. The USDJPY has been a difficult pair to trade this year as it went down to 102 and then came back to 115. Now we are at 112.9 but the uptrend from 108 is still steadily holding. Only below 111, do we turn down for good. Tiill then watch for chances to buy. So looking at overall situation, the economy world over is doing fine. Growth is steadily holding even as central banks reduce assets. Political uncertainity is a major worry for investors but one that cannot be quantifed. While the stock markets have been volatile but it has not broken its major support. Till S&P500 holds 2560, we see a another rally to to 2900 and above. If interested to trade our highly successful trading system, please email us at teamcot@fxcot.com.